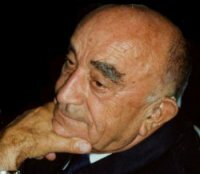 Professor Václav Vojta was born on 12.07.1917 in Mokrosuky, Bohemia (The Czech Republic). In 1937 he began his medical studies at the Charles University in Prague; however, due to the German occupation and the upheavals of the war, he was only able to gain his doctorate in 1947. In the same year, he began his specialist training in neurology and paediatric neurology. From 1948 to 1956, he was a junior doctor in the neurology clinic at the Charles University in Prague under Professor Henner; from 1956, head of the paediatric neurology department at the IV. Clinic of the medical faculty of the University of Prague. In 1961 he was entrusted with heading the faculty policlinic for paediatric neurology in Prague. Into this—as Professor Vojta used to say—first most fruitful period of his work, came the invasion of the Warsaw Pact troops in August 1968. Professor Vojta had to fear for his personal and professional future, and decided not to return to his homeland from holiday in Yugoslavia with his wife and three small children. He sought refuge for himself and his family in the Federal Republic of Germany. Professor Imhäuser, at that time head of the University Orthopaedic University Clinic in Cologne, took on Professor Vojta in the autumn of 1968 as a scientific assistant at his clinic, thus giving him the opportunity to take his development kinesiological studies and investigations further and to run diagnostic courses for doctors as well as therapy courses for physiotherapists. In the spring of 1975, Professor Vojta moved to the Munich Children’s Centre in the Oberbayern district. There he became Professor Hellbrügge’s deputy and head of the rehabilitation department. After the break-up of the communist regime in Czechoslovakia, Dr Vojta was awarded the professorship of paediatric neurology and rehabilitation at the Charles University in Prague. Twenty-five years earlier, as a “politically unreliable person”, he had not been allowed tenure. On 31.12.1995 Professor Vojta retired from the Munich Children’s Centre, but continued to work in Munich as a scientist, doctor and teacher. On 12th September 2000, Professor Vojta died after a short, serious illness. Professor Vojta's neurokinesiological examination techniques - postural responses and reflexology—are used throughout the world today for the early recognition of motor developmental disturbances in new-born babies and infants. They are the basis for starting therapy as early as possible—even before any concrete disturbances are recognisable clinically. The physiotherapy developed by Professor Vojta using reflex locomotion is based on his findings on the development of posture and movement in children. This therapy has also spread throughout the world. Professor Vojta discovered the bases of reflex locomotion while searching for treatment possibilities for young people with cerebral palsy and spastic paralysis. Today, reflex locomotion is successfully used in numerous conditions affecting new-borns, children, adolescents and adults e.g. meningomyelocele, peripheral paralysis, arthrogryposis multiplex congenita, scoliosis, hip dysplasia and dislocation, after concussions, paraplegia and many more. While working at the University Psychiatric Prague, in 1954 Professor Vojta was given by the then head of the clinic, Professor Henner, the task of launching a treatment programme for children with cerebral palsy for a newly opened clinic in north-eastern Bohemia. It was then that Professor Vojta discovered the key to treating children with cerebral palsy. From 1959, he developed the Vojta Principle out of this therapy. In retrospect, the development of Vojta Therapy has proven not to be a “chance discovery” or the result of an isolated idea. Rather, it is the result of more than ten years of systematic work made possible by Professor Vojta’s incredibly keen gift for observation, his well-honed sense for recognising complex locomotor relationships and, above all, his sheer unending passion for research. At the beginning, Professor Vojta made the observation that in certain body positions a contraction of the neck and trunk musculature could be induced by manipulation of a talipes equinus, and conversely that the tension in the talipes equinus could be increased by a conscious raising of the head. Proceeding from this, tests were then made with head movements against resistance and similar tests with the axis organ, each time from different positions. While doing this, he made the surprising discovery that he could activate muscle groups that could not otherwise be activated and above all that children with cerebral palsy treated like this afterwards exhibited better gait, better posture and better speech (!). These first successes were encouraging. Building on this, he tried to influence a primitive pelvis flexion posture often found in children with cerebral palsy. He put these children in a squatting position with their feet hanging freely over the edge of the table. While attempting to induce a reclination of the head and to achieve an arm support reaction from this position, he observed massive reactions in the multifidus muscle, head rotation, extension of the axis organ, a contraction of the abdominal musculature etc. A host of further experiments with the “squatting position” finally led Professor Vojta to discover further complex muscle reactions and above all to recognise that many of the movement complexes that he had found could be traced back to a common, subjective, innate (locomotor) pattern of movement. Using these inductively gained experiences as a starting point, Professor Vojta then discovered and tested in a relatively short space of time a variety of mechanisms for the targeted stimulation of these innate patterns of movement. At the same time, he developed a number of crucial ideas on movement development and movement analysis, by means of which the course of therapy can be better analysed, planned and assessed. He likewise got a view of the efficacy and limits of his concept from continually dealing with innumerable therapy reports. If the emphasis of this work initially lay in the area of paediatrics, very soon the first elements of his concept of treatment could also be applied to neurological problems in adult patients. Today successes can be seen here as well. Alongside his therapy, Professor Vojta campaigned for the advancement of diagnostics using postural responses. With his research, he broadened the content and extent of our knowledge of postural responses and on this basis developed concepts to detect the onset of cerebral palsy early. Of great significance is his discovery of retardation coefficients in postural reactability disturbances. If this retardation is harmonious, mental development disturbance must be considered already in development in early infancy. 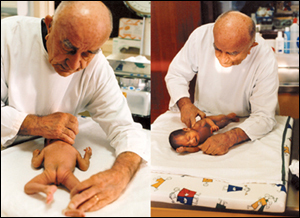 Prof Dr Václav Vojta treating a premature infant. According to Vojta, neurokinesiological investigations enable not only postural reactability to be assessed using the postural responses, but also spontaneous motor activity and the uprighting mechanisms, before the background of the contents of postural ontogenesis (postural activity), as well as the dynamic of regression to neonatal reflexes (primitive reflexes). In the course of his work in Czechoslovakia and the Federal Republic of Germany, Professor Vojta published more than 100 scientific works and produced two comprehensive monographs in his field of study. His two textbooks: Die zerebrale Bewegungsstörungen im Säuglingsalter [Cerebral Movement Disturbances in Infancy] (7th revised and expanded edition, Hippokrates Verlag, 2007) and Vojta-Prinzip [The Vojta Principle] (Third, fully revised edition, Springer Verlag, 2007), written together with Anne Peters, have appeared in several editions and been translated into several languages. His works have prompted a variety of further scientific works throughout the whole world. As well as advancing paediatric diagnostics and developing a new therapy, Professor Vojta made further training and qualification the third emphasis of his work. Already before his emigration to the Federal Republic of Germany, he had begun to construct a qualification system for doctors and physiotherapists. From 1967 Professor Vojta held seminars for doctors on neurokinesiological diagnostics and for physiotherapists on the application of development kinesiological therapy in new-born babies, infants, adolescents and adults with movement disturbances. The non-profit International Vojta Society (IVS), with its headquarters in Munich, which Professor Vojta presided over until his death, runs annual qualification seminars for doctors in Germany in kinesiological and neurological examination techniques in new-borns, babies and infants. Furthermore, every year it trains around 150 physiotherapists focusing on the treatment of new-born babies and children as well as on adult therapy. Professor Vojta played an active part in all advanced courses. His charisma, authority and expertise made their mark on the courses and turned them into a lasting experience for all participants. As well as the German courses, Professor Vojta was invited to numerous countries in Europe, Asia, America and Australia to give talks and to run courses. He supervised qualification courses in his homeland, the present-day Czech Republic, as well in the Netherlands, Austria, Spain, Norway, Poland, Korea, Japan, Mexico, Italy, Argentina and Chile. In 1974 Professor Vojta received the Heine Prize, the highest award of the German Society for Orthopaedics. In 1979 Aktion Sonnenschein [a German association based in Munich that works towards the integration of children with and without disabilities] awarded him the “Growing with Each Other” Medal. In 1983 he won the Ernst von Bergmann Prize for further training in medicine from the German Medical Association, in 1990 the von Pfaundler Medal for further training in paediatrics from the Professional Association of Paediatricians. Professor Vojta was a holder of the Federal Cross of Merit. He was awarded high honours in Japan and Korea. The Collegium Catholicum Medicinae in Seoul, Korea, named him an honorary professor in 1994. From 1992 until the end he once more held regular lectures at “his” neurology faculty, the Charles University in Prague, where in 1996 he was given renewed tenure and named associate professor for neurology and paediatric neurology. 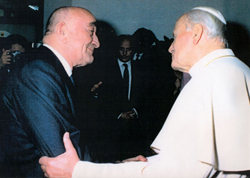 In his homeland, Prof Vojta was posthumously awarded the Czech Order of Merit by President Havel in October 2000.